This medication is used to treat or prevent certain urinary tract infections. This medication is an antibiotic that works by stopping the growth of bacteria. It will not work for viral infections (e.g., common cold, flu). Unnecessary use or overuse of any antibiotic can lead to its decreased effectiveness. Nitrofurantoin should not be used in children less than one month of age due to the risk of a certain blood problem (hemolytic anemia). Take this medication by mouth, with food or milk, as directed by your doctor. This medication is usually taken four times daily to treat an infection or once daily at bedtime to prevent infections. Swallow the medication whole. Avoid using magnesium trisilicate-containing antacids while taking this medication. Magnesium trisilicate-containing antacids bind with nitrofurantoin, preventing its full absorption. Dosage and duration is based on your medical condition and response to therapy. For children, the dosage is also based on body weight. When taking this medication to prevent infection, take it exactly as directed by your doctor. Do not skip doses or stop taking it without your doctor's approval. Inform your doctor if you notice signs of a new urinary tract infection (e.g., pain while you are urinating). If you are taking this medication to treat an infection, continue to take this medication until the full-prescribed amount is finished, even if symptoms disappear after a few days. Stopping the medication too early may allow bacteria to continue to grow, which may result in a relapse of the infection. Inform your doctor if your condition persists or worsens. What conditions does Nitrofurantoin treat? This medication may cause your urine to turn dark yellow or brown in color. This effect is harmless and will disappear when the medication is stopped. This medication may rarely cause very serious (possibly fatal) lung problems. Lung problems may occur within the first month of treatment or after long-term use of nitrofurantoin (generally for 6 months or longer). Get medical help right away if you develop symptoms of lung problems, including: persistent cough, chest pain, shortness of breath/trouble breathing, joint/muscle pain, bluish/purplish skin. Tell your doctor right away if any of these rare but very serious side effects occur: new signs of infection (e.g., fever, persistent sore throat), easy bruising/bleeding, mental/mood changes, persistent or severe headaches, vision changes. This drug may rarely cause serious (possibly fatal) liver disease, blood or nerve problems. Tell your doctor right away if you notice any of the following rare but very serious side effects: persistent nausea/vomiting, dark urine, yellowing of eyes/skin, unusual/persistent fatigue, fast/pounding heartbeat, numbness/tingling of the arms/legs, muscle weakness. This medication may rarely cause a severe intestinal condition (Clostridium difficile-associated diarrhea) due to a type of resistant bacteria. This condition may occur during treatment or weeks to months after treatment has stopped. Do not use anti-diarrhea products or narcotic pain medications if you have any of the following symptoms because these products may make them worse. Tell your doctor right away if you develop: persistent diarrhea, abdominal or stomach pain/cramping, blood/mucus in your stool. Use of this medication for prolonged or repeated periods may result in oral thrush or a new vaginal yeast infection (e.g., oral or vaginal fungal infection). Contact your doctor if you notice white patches in your mouth, a change in vaginal discharge, or other new symptoms. List Nitrofurantoin side effects by likelihood and severity. This medication should not be used if you have certain medical conditions. Before using this medicine, consult your doctor or pharmacist if you have: little or no urine output (oliguria or anuria), severe kidney disease, certain genetic conditions (glucose-6-phosphate dehydrogenase deficiency), a history of liver problems due to nitrofurantoin use in the past. Before using this medication, tell your doctor or pharmacist your medical history, especially of: certain blood disorders (e.g., anemia), kidney or liver problems, lung diseases, certain nerve problems (peripheral neuropathy), certain eye diseases (optic neuritis), diabetes, untreated mineral imbalance, vitamin B deficiency. This medication should be used only when clearly needed during pregnancy. This medication should not be taken if you are at term (weeks 38-42 of pregnancy), near or at the time of delivery due to possible harm to the newborn, such as a certain blood problem (hemolytic anemia). Discuss the risks and benefits with your doctor. This medication passes into breast milk and may have undesirable effects on nursing infants less than one month old and infants with a certain genetic condition (G-6-PD deficiency). Consult your doctor before breast-feeding. What should I know regarding pregnancy, nursing and administering Nitrofurantoin to children or the elderly? Before using this medication, tell your doctor or pharmacist of all prescription and nonprescription/herbal products you may use, especially of: sulfinpyrazone. This drug can affect the results of certain urine glucose tests (cupric sulfate-type). Make sure laboratory personnel and your doctors know you use this drug. Does Nitrofurantoin interact with other medications? Should I avoid certain foods while taking Nitrofurantoin? Laboratory and/or medical tests (e.g., complete blood counts, tests for kidney and liver function, urine cultures) should be performed periodically to monitor your progress or check for side effects. Consult your doctor for more details. Do not flush medications down the toilet or pour them into a drain unless instructed to do so. Properly discard this product when it is expired or no longer needed. Consult your pharmacist or local waste disposal company for more details about how to safely discard your product.Information last revised February 2017. Copyright(c) 2017 First Databank, Inc. 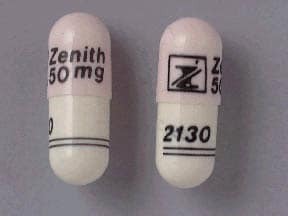 This medicine is a pink white, oblong, capsule imprinted with "logo and Zenith 50 mg" and "2130". 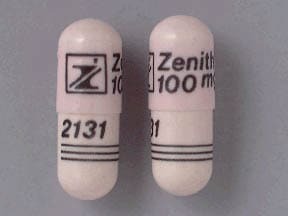 This medicine is a pink, oblong, capsule imprinted with "logo and Zenith 100 mg" and "2131". 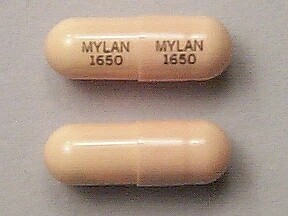 This medicine is a light brown, oblong, capsule imprinted with "MYLAN 1650" and "MYLAN 1650". 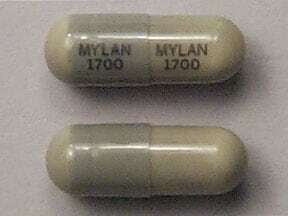 This medicine is a gray, oblong, capsule imprinted with "MYLAN 1700" and "MYLAN 1700". 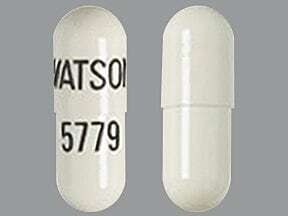 This medicine is a white, oblong, capsule imprinted with "WATSON" and "5779". 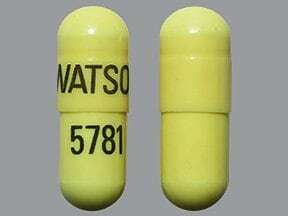 This medicine is a yellow white, oblong, capsule imprinted with "WATSON" and "5780". 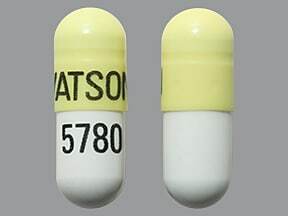 This medicine is a yellow, oblong, capsule imprinted with "WATSON" and "5781". 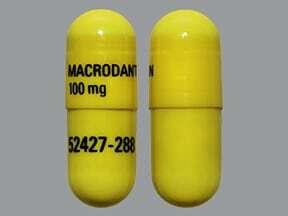 This medicine is a yellow, oblong, capsule imprinted with "MACRODANTIN 100 mg" and "52427-288". 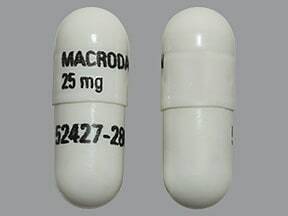 This medicine is a white, oblong, capsule imprinted with "MACRODANTIN 25 mg" and "52427-286". 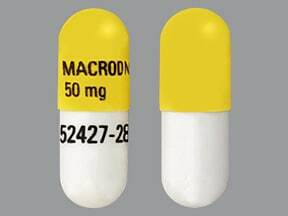 This medicine is a yellow white, oblong, capsule imprinted with "MACRODANTIN 50 mg" and "52427-287". 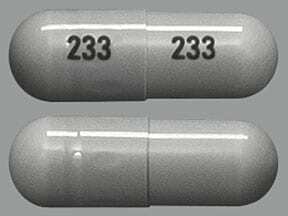 This medicine is a gray, oblong, capsule imprinted with "233" and "233". 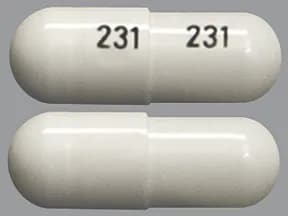 This medicine is a white, oblong, capsule imprinted with "231" and "231". 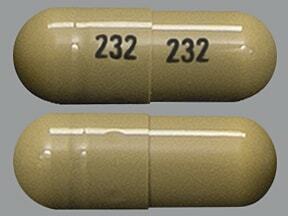 This medicine is a light brown, oblong, capsule imprinted with "232" and "232". Are you considering switching to Nitrofurantoin? How long have you been taking Nitrofurantoin?